Methyl-coenzyme M reductase with coenzyme F430 in magenta and the substrate coenzyme B in orange. Methanogenic archaea produce about a billion tons of methane each year. Methanogens are tiny microbes similar to bacteria that colonize anaerobic environments such as the bottom of lakes and swamps or the gut of cows and humans. They feed on molecules like carbon dioxide, methanol and acetic acid that are produced by fermenting bacteria, and release methane as their waste product, bubbling up as marsh gas, or in the case of our own resident methanogens, less socially-acceptable gases. Most methanogens convert hydrogen gas and carbon dioxide into methane and water. This tricky operation requires a series of enzymes that progressively strip oxygen atoms off the carbon and add hydrogen. The enzyme methyl-coenzyme M reductase, shown here from PDB entry 1mro , performs the last reaction in the process, releasing methane. It is a large complex composed of six chains: two copies of three different types. 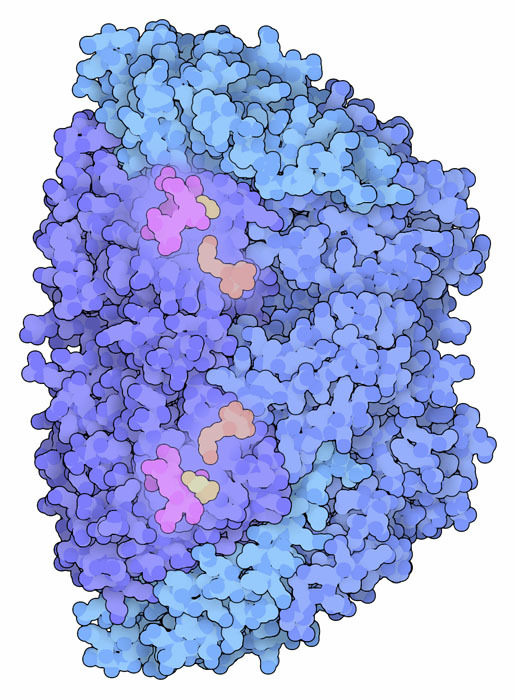 The enzyme has two active sites buried at the base of deep tunnels, protecting the reaction from the surrounding water. Methanogens have recently drawn more attention because the may provide a way to convert discarded biological waste, like sewage and manure, into useful biogas, which may be used for heating and generation of electricity. Methanogens, along with a variety of other anaerobic microbes, are mixed together in an anaerobic digester, where they break down all types of biological molecules into their simplest components. Methanogens are also getting attention in the context of global warming, since about a third of the naturally-produced methane escapes as greenhouse gas into the atmosphere. Coenzyme F430 and several modified amino acids from methyl-coenzyme M reductase. The reaction performed by methyl-coenzyme M reductase is difficult and requires the assistance of several unusual molecules. The enzyme contains a unique cofactor, called F430, which is similar to the heme group used by hemoglobin, but has a few extra rings, not as many double bonds, and carries an atom of nickel instead of iron. The F430 ring stabilizes the nickel atom in a highly reactive state, which is important for the reaction because the substrate methyl-coenzyme M is rather inert. The reaction is further tuned by modification of several amino acids surrounding the enzyme active site. Methyl groups are added to four different amino acids, and an oxygen atom in one particular glycine is swapped for a sulfur atom. 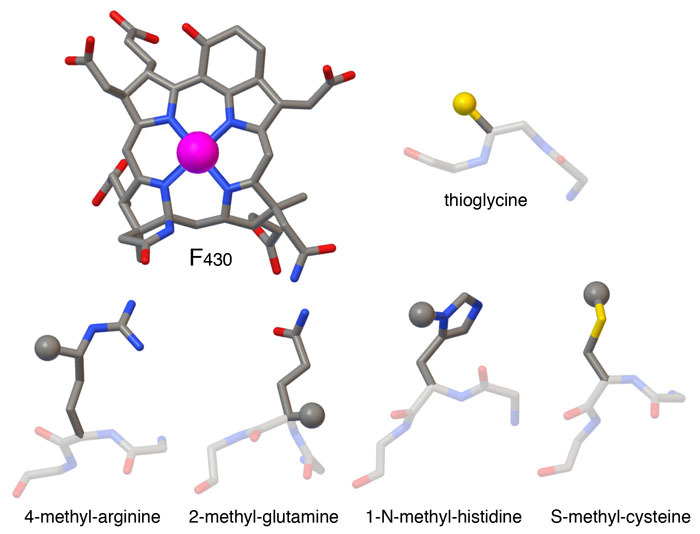 Two structures give a glimpse of the enzyme before and after its reaction. Before the reaction, the enzyme binds to two cofactors: coenzyme M, which carries the methyl group, and coenzyme B. The enzyme releases the methyl group as methane, and connects the two coenzymes together with a disulfide linkage. This unusual disulfide-linked molecule is then used by the cell to produce energy. PDB entry 1mro (on the left) shows the two coenzymes before the reaction (but doesn't include the methyl group--it would normally be attached to the smaller of the two, as shown with the dotted circle). PDB entry 1hbm (on the right) shows the linked molecule after the reaction. To explore these structures in more detail, click on the image for an interactive JSmol. Try using one of the 3D viewers at the PDB to view the amino acids that lock F430 in place, and position the two substrates. Nickel is relatively rare in enzymes, but is occasionally used in reactions that involve small gas molecules, such as in nickel-iron hydrogenase. Many bacteria have a system of proteins to gather nickel ions from their environment: try searching for "nickel transport" at the RCSB PDB to see some of these proteins. U. Ermler (2005) On the mechanism of methyl-coenzyme M reductase. Dalton Transactions 2005, 3451-3458. 1hbm: W. Grabarse, F. Mahlert, E. C. Duin, M. Goubeaud, S. Shima, R. K. Thauer, V. Lamzin & U. Ermler (2001) On the mechanism of biological methane formation: structural evidence for conformational changes in methyl-coenzyme M reductase upon substrate binding. Journal of Molecular Biology 309, 315-330. 1mro: U. Ermler, W. Grabarse, S. Shima, M. Goubeaud & R. K. Thauer (1997) Crystal structure of methyl-coenzyme M reductase: the key enzyme of biological methane production. Science 278, 1457-1462.